Bernie Mac was an American comedian and actor. He passed away on August 9, 2008. 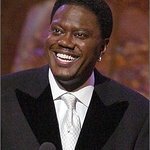 Bernie Mac has passed away, but we remember his charity work. Google trends for "Bernie Mac"
We don't have any videos related to Bernie Mac.